This is a small sized scale model with “big” performance. The Saab J 21 is not equipped with landing gear and it is easily hand thrown. Its unique layout makes it an interesting model with suberb handling qualities, it has ideal proportions for a flying scale model. This model is recommended to the average builder/pilot with experience from a couple of models before. The kit takes about 35 hours to complete. The J 21 has a scale contour and can be built to a very accurate model of the full size. The J 21 was the beginning of a long tradition within the Saab company to come up with unconventional solutions on design problems. The layout of the J 21 provided the pilot good allround view and made it possible to install heavy armament in the nose of the aircraft. The prototype flew for the first time in 1943 and was one of the first aircrafts in the world to be equipped with an ejection seat. Total production reached approx. 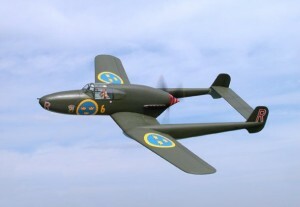 300 aircraft and it served in the Swedish Air Force during 1945 – 1953. Today only a few J 21 is preserved in museums, among them is ”Röd Rudolf” at Flygvapenmuseum in Linköping.